Over the past few seasons, 2-1A has become a top-heavy classification with only a small number of teams believed to be capable of winning the state title. This season is no different. The same five teams have occupied the five spots in our Kpreps rankings all year. But that doesn’t mean there won’t be some exciting football ahead. Last season in the 2-1A state title game, Centralia led Meade 25-14 with under three minutes remaining. The Buffaloes rallied for two quick touchdowns to stun the Panthers and keep Centralia from winning back-to-back championships. Both the Buffaloes and Panthers should challenge for the title again this season. Centralia is the odds on favorite to win it after returning nearly every starter from last year’s team. The Panthers have rolled to a 4-0 start by allowing only seven total points and one opponent to gain more than 100 yards of total offense. Meade dropped their opener to Holcomb 21-20. It’s the second consecutive season the Buffaloes suffered a one-point loss to the Longhorns to open the season. Meade has dropped its season opener three of the past four years. The two times prior to this season, the Buffaloes finished as state champions. Centralia (4-0) – The Panthers are the clear-cut favorite to get back to the 2-1A title game in Hays. Centralia has dominated opponents thus far to the tune of 179-7. Centralia didn’t allow a point until last week’s 64-7 win over Onaga. That was also the first time the Panthers allowed an opponent more than 100 yards of total offense. Onaga rushed for 155 yards on 44 carries. Seniors Sam Steinlage (550 yards, 9TD) and J.T. Rosine (372 yards, 5TDs) lead the Panther offense. Rosine has also thrown for 194 yards and two scores on just 11 of 17 passing. Jackson Heights (4-0) – Last season, Caleb Wick took over a Cobra program that was just 6-39 in the previous five seasons. He led them to a 6-4 mark and a playoff berth. This season Jackson Heights has 11 returning starters and is off to a 4-0 start having outscored opponents by an average of 40 to 7. The Cobras will open district play with Troy; a team they fell to 8-6 a year ago. Troy (2-2) – Troy is trying to end a three-year playoff drought under first year coach Derek Jasper. The Trojans opened the season with wins over Atchison County and Maur Hill before consecutive losses to Horton and Riverside. The Troy offense struggled in those two losses only putting up six points per game. Collin Jasper has had some success throwing the ball this season and will need that trend to continue in district play. Valley Heights (2-2) – Valley Heights is off to a 2-2 start having won an overtime game over Valley Falls and dropped a 27-20 decision to Washington County last week. The Mustangs have a pair of solid running threats in seniors Derek Trimble (458 yards, 4TDs) and Cole Maddox (403 yards, 6TDs). Doniphan West (0-4) – Doniphan West is has lost all four games this season, but has been competitive against solid competition. The Mustangs losses have come to opponents who are a combined 11-5 this season. Doniphan West was close in a 14-13 loss to Atchison County in Week 3. The Mustangs will have to improve an offense that’s averaging just six points per game in order to challenge in this district. McLouth (2-2) – The Bulldogs are coming off a 35-28 loss to Olpe. In that game, McLouth’s Nick McAferty, a Kpreps All-State selection last season, caught 10 passes for 179 yards and three touchdowns. The Bulldogs aim to get back into the playoffs after advancing to the second round a year ago. Oskaloosa (1-3) – The Bears opened the season with a close win over Maur Hill. Since then, they have dropped three straight to Jackson Heights, Pleasant Ridge and Christ Prep Academy. Coached by Scott Whaley, the Bears are trying to get back to the playoffs for the first time since 2010. Oskaloosa has a good chance to do so as it is one of only two teams in the district that has won a game so far. Jefferson Co. North (0-4) – The Chargers have struggled so far this season, losing each game by 19 points or more. James Pisachubee has displayed big-play ability, scoring on an 80-yard touchdown run in last week’s 36-17 loss to Jayhawk-Linn. The Chargers have advanced to the first round of the playoffs in each of the past two years. Leavenworth-Immaculata (0-4) – The Raiders have lost all four games, but they have shown they are capable of putting some points on the board with an average of 20.5 points per outing. Justin Varney has passed for 561 yards and nine touchdowns, but has thrown 10 interceptions. Drew Sachen leads the Raiders in rushing with 395 yards and three touchdowns. Immaculata hasn’t made the postseason since 2007. Valley Falls (0-4) – The Dragons haven’t been able to secure that first victory of the season, but they have played close games with Valley Heights and Atchison County. Injuries have been a factor for the Dragons early, but they hope their health will improve as they begin their goal of making the playoffs for the first time since 2010. Key Games: Every game is important in a district that does not have much separation from top to bottom. However, this Friday’s game of Valley Falls at Oskaloosa will probably give us a better indication of where everyone stands. Chase County (1-3) – The Bulldogs opened the season with a convincing victory against Osage City. Since then, they have lost three straight to West Franklin, Council Grove and Mission Valley. Senior Troy Higgs leads the Chase County offense as he has thrown for 546 yards and five touchdowns. Junior Brendan Watts has been his top target with 24 receptions for 353 yards and four touchdowns. Northern Heights (1-3) – The Wildcats have played their opponents tight in every game, losing by no more than 13 points. Junior Mitchell Wecker has been a key to the offense, passing for 190 yards and two touchdowns, rushing for 378 yards and four touchdowns and receiving 173 yards and a touchdown. Onaga (1-3) – The Buffaloes are only 1-3, but their three losses are to teams with a combined 8-4 record. Onaga is primarily a running team, rushing for 315 yards per game. Junior Michael Bliss leads with 454 rushing yards with three touchdowns. Junior Wyatt Cordell has rushed for 434 yards and two touchdowns. The Buffaloes have made the playoffs in four of the past five years. Wabaunsee (1-3) – The Chargers defeated Rock Creek 16-7 in Week 2, but they have been shut out in losses to Silver Lake, Rossville and St. Marys. They play a tough Mid-East League schedule against some of the top Class 3A schools. The Chargers were limited to 92 yards of total offense in last week’s loss to St. Marys. Wabaunsee has advanced to the first round of the playoffs in three of the past four seasons. Herington (0-4) – The Railers have allowed more than 50 points in every game this season. Herington is on a 17-game losing streak since opening the 2011 season with a 5-0 record. The Railers have won more than one game in a season only twice since 2004. Key Games: All games are key in a district that appears to be wide open. Lyndon (4-0) – The fifth-ranked Tigers have cruised their first four games, scoring 50 points or more in each contest. Quarterback Joe Walsh has led the Lyndon offensive attack with 803 yards passing and 10 touchdowns. Josh Owens is the team’s leading rusher with 686 yards and nine touchdowns. The Tigers are looking to make another playoff run after advancing to sub-state last year. Olpe (2-2) – After opening the season 0-2, the Eagles have bounced back with consecutive wins over Jefferson County North and McLouth. Bo Krueger passed for two touchdowns and rushed for another in last week’s win over McLouth. Olpe has made the playoffs in all but two seasons since 2003. Jayhawk-Linn (2-2) – The Jayhawks have notched consecutive victories over Leavenworth-Immaculata and Jefferson County North after opening the season 0-2. Tommy Avery rushed for four touchdowns in last week’s win. The Jayhawks look to make the playoffs for the first time since 2009. Northeast-Arma (1-3) – The Vikings are led by one of Class 2-1A’s best dual-threat quarterbacks in J.T. Richardson. The senior has passed for 486 yards, while rushing for 523 yards this season. Sophomore Drew Mills has 261 yards receiving and 125 yards rushing. Northeast hopes to end a long playoff drought. Oswego (1-3) – The Indians opened the season with a win over Fredonia but have lost the past three games to Eureka, Commerce, Okla., and Humboldt. Senior Brant Yeoman leads the Oswego rushing attack with 437 yards and four touchdowns. The Indians are attempting to make the playoffs for the first time since 2009. Key Games: Lyndon appears to be the class of District 4. Watch for Oswego at Olpe (Wk 6), Olpe at Northeast (Wk 7), and Oswego at Northeast (Wk 9) to decide the runner-up spot. La Crosse (4-0) – La Crosse has retooled behind a group of upperclassmen that have elevated its play. Senior lineman Cody Lee has 11 tackles for loss after he recorded none last season. Junior Andrew Jay has become an all-purpose threat with 790 all-purpose yards after he recorded 130 all-purpose yards as a sophomore. Junior quarterback Jack Garcia has continued to play at a high level. However, the Leopards will likely have to play most or all of the season without dominant defensive end Sheldon Schmidt, who suffered a knee injury last week. Inman (3-1) – Inman has played in four low-scoring games. The Teutons defeated Moundridge 15-6, beat Bennington 22-20, won against Hutchinson Trinity 14-7 and then lost, 35-0, to Marion last week. Inman went 6-3 last season and is looking for its first playoff berth since 2003. Medicine Lodge (1-3) – Medicine Lodge lost 61-33 to Wichita Independent in Week 1, then beat Bluestem 34-14 before two losses by 20 and 25 points. The Indians have not had a winning season since a 5-4 record in 2009. Ellinwood (0-4) – Ellinwood has struggled mightily in its last season of 11-man football before it drops down to the eight-man ranks. The Eagles have lost two games by 49 points or more. The other two losses came by 16 to Thomas More Prep-Marian and by 20 to Ellis. Those are the lone victories by those two schools. Sterling (0-4) – Sterling has started 0-4 for the second straight season, but its last three losses came by 11, 12 and three points. Last season, the Black Bears also started 0-4 with two close losses and then advanced to the second round of the state playoffs. Key Games: (Wk 8) Inman at Sterling will likely decide the runner-up spot. Ell-Saline (2-2) – Cardinal Senior Justin Schmutz has 79 carries for 525 yards and eight touchdowns. Junior quarterback Cody Walters has completed 17 of 36 passes for 327 yards with two touchdowns against one interception. The Cardinals have committed eight turnovers and are minus-3 in turnover margin. Ell-Saline finished as district runner-up to Smith Center last season. Smith Center (2-2) – The Redmen, under first-year coach Darren Sasse, have averaged 195 rushing yards and 102 passing yards a contest. Senior Grant Lambert has rushed 35 times for 215 yards and four scores, while quarterback Kody Molzahn is 18 of 42 passing for 409 yards with five scores. The Redmen won the district last season and defeated Norton and Oberlin. Smith Center has quality losses to undefeated Class 3A powers Beloit and Phillipsburg. Washington County (2-2) – Washington County is one of the few small school teams that has averaged more passing yards (147) than rushing yards (106) per game. Sophomore quarterback Konner Penning has completed 39 of 64 passes for 507 yards with a 3/3 TD/INT ratio. The Tigers are coming off back-to-back three win seasons. Bennington (1-3) – Bennington started off with a 60-20 victory against Remington, then lost to Inman 22-20 before back-to-back big losses by a combined score of 93-6. The Bulldogs have passed for 90 yards a game and rushed for 188 yards a contest. Four players have rushed between 105 and 216 yards. Bennington finished 4-5 last season after an 0-9 mark last year. Plainville (1-3) – Plainville has played the No. 5-hardest strength of schedule en route to losses of Norton, Smith Center and La Crosse. Freshman running back Hayden Friend has played well for the Cardinals, while senior Hadley Gillum has been solid at quarterback and defensive end. Republic County (0-4) – The Buffs have struggled for many seasons and this fall is no different under first-year coach Travis Johnson. Opponents have outscored the Buffs 161-20. The program has just one victory in the last six seasons, a 22-7 win against Sacred Heart in 2010. Oakley (3-1) – Oakley ranks second in Class 2-1A in scoring defense (14 points allowed) and has pitched three shutouts. The Plainsmen only points allowed came in a 14-6 Week 3 loss to Phillipsburg. The other three victories were 26-0, 70-0 and 72-0. St. Francis (2-1) – St. Francis has played just one game against a Kansas team in its last season of 11-man football. The Indians lost 28-8 to Holyoke, Colo. in the season opener and then posted shutouts in its next two games before a bye last week. Ellis (1-3) – A very young Ellis team opened the season with two losses by a combined score of 90-8 and then defeated Ellinwood 36-16 before a 39-7 loss to Larned last week. Three different players have played quarterback and the Railers have completed 11 of 34 passes for 181 yards and a 0/3 TD/INT ratio. Junior Jared Pfeifer, the Railers’ fastest player, has missed most of the last two games with a foot injury. Senior Landon Younger has 61 carries for 494 yards and seven TDs. Leoti-Wichita Co. (1-3) – Opponents have outscored Leoti 131-67. The Indians lost 27-20 to Stanton County in Week 2 and defeated Syracuse 25-6 in Week 3. Senior Colton Northrup has rushed 65 times for 412 yards and two scores. Senior Jantz Budde has completed 20 of 61 passes for 363 yards with a 3/4 TD/INT ratio. Oberlin-Decatur Co. (1-3) – Oberlin has played the No. 9-hardest strength of schedule in Class 2-1A. The program opened with a 19-12 victory against Cambridge, Neb. and then two games by a combined score of 78-8 before a 21-13 loss to Norton last week. Oberlin will drop to the eight-man ranks next season. Key Games: Oakley is the class of the district, but St. Francis, Ellis and Oberlin will battle it out for the runner-up spot. Elkhart (4-0) – Elkhart, with four-year starting quarterback Alex Gomez, has put up big numbers, including 236 passing and 239 rushing yards per game. The program is tied for fifth in the classification in scoring offense at 158 points. Gomez has completed 44 of 87 passes for 944 yards with a 13/3 TD/INT ratio. He has also rushed 64 times for 338 yards and six scores. The Wildcats are one of just five undefeated teams left in Class 2-1A and only La Crosse and Elkhart are undefeated on the west half of the bracket. Meade (3-1) – Meade lost to Holcomb by one point in the season opener for the second straight season. Since then, the Buffs have won by 28, 49 and 42 points. The defending Class 2-1A champions have rushed for 320 yards a game. Senior Jett Little has completed 14 of 25 passes for 235 yards with a 5/1 TD/INT ratio. He has also rushed 93 times for 597 yards and 13 scores. Stanton County (1-3) – After three seasons of 10-2, 9-2 and 8-2, the Trojans graduated a big class of talented players and coach Bret Kendrick moved on as well. Stanton County has fallen back to 1-3. The Trojans have taken three shutouts by scores of 19-0, 28-0 and 20-0, but defeated Wichita County, 27-20, in Week 2. Sublette (0-4) – Sublette has lost every game by at least 28 points. Opponents have outscored the Larks 212-35. Sublette went 2-7 last season. Syracuse (0-4) – Syracuse has struggled for many years and has scored just six points this season. The Bulldogs lone victory in the last four years was a 34-14 victory against Satanta in Week 5 of the 2011 season. The Bulldogs haven’t reached the playoffs since 2004. 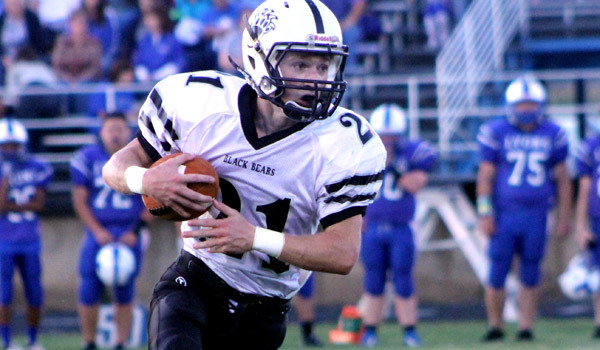 Key Game: (Wk 8) Meade at Elkhart will decide both playoffs spots.